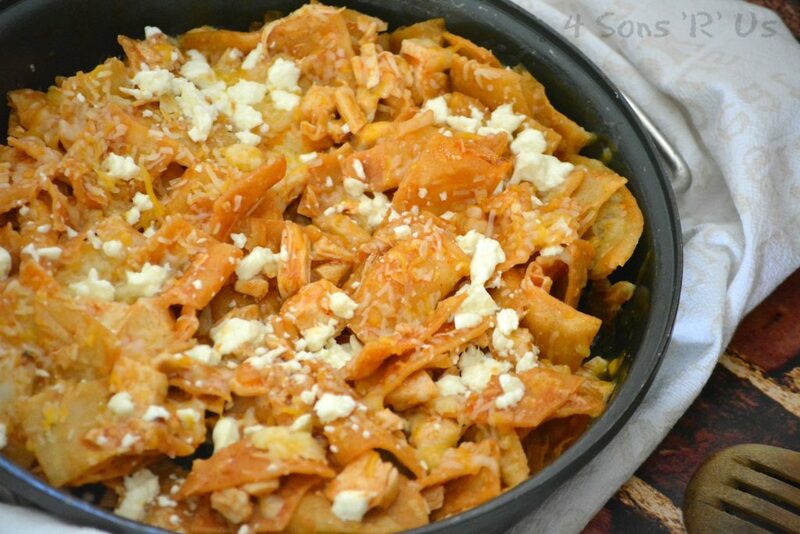 Good Mexican food is never far away, if you’ve got this recipe for cheesy Chicken Chilaquiles on hand. Both the Hubs & I love good Mexican food. Well, I guess I should really change that to we really love real Hispanic foods. Not Tex Mex fast food like Taco Bell, although that does have it’s time & place. Hello, to my late night, just left a party college years. Actual authentic cuisine, made the way God and the culture intended. There are a few smaller establishments we’ll eat at when we get a craving and want to take the family out. Few though ever really live up to our expectations. We actively seek out the hole in the wall, small Mom & Pop places. Even the ones in less attractive areas. We’ve found some real gems over the years too, and discovered some real favorites. Favorite dishes I mean. Our whole concept of ‘tacos’ have changed. Papusas? I kicked grilled cheese to the curb after my first bite, there’s no other cheesy miracle that could ever compare. I’m also half convinced no other culture knows what to do with steak, or so many different ways to season and prepare it. Then there was the fateful day that we ventured out to a local flea market. We didn’t expect them to serve food, we were just looking for hidden treasures and maybe a few blog props. As soon as we got out of the car though, the smell hit us. It was Heavenly, and we were both immediately starving! The menu was mostly in Spanish, which my Husband only understood a couple basic words of. I hate to admit it, but after four years in high school and college- I can read it, but am far from fluent when it comes to speaking though. I’ve learned over the years though, that when I am attempting to speak to someone in their native tongue, they’re almost always enthusiastic to have a conversation. Halting and broken though it may be on my end, they want to share in the language and appreciate the effort. Thanks to this, we were able to get a couple recommendations from the cook. The hubs opted for their steak tacos, big surprise! I sprung for the chilaquiles that were enthusiastically recommended, knowing nothing more than it was some dish consisting of chicken and fried tortillas bathed in sauce. 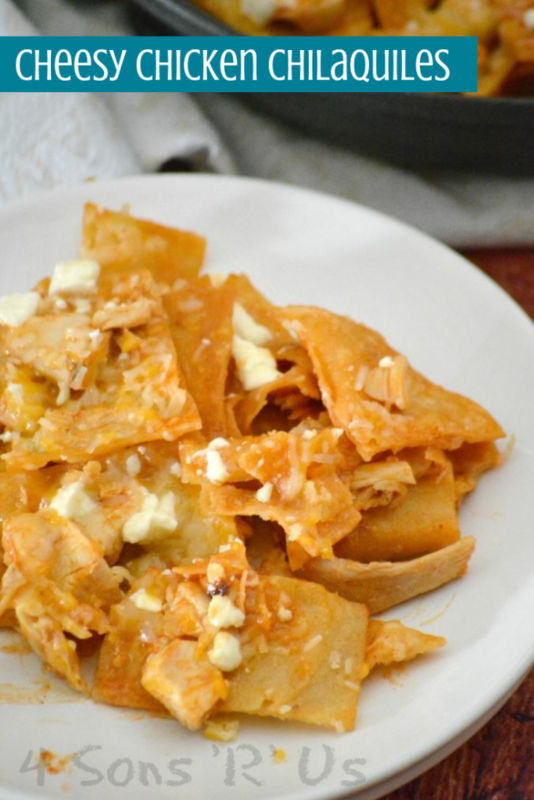 We went back to the flea market once a month for almost two years, until the kitchen closed, just for the chilaquiles. I’ve had Tex Mex versions since. They’re good, but never as great as the real deal. The difference seems to be the ingredients that are similar, but not the same. Tortilla chips are not the original base, instead fresh, lightly fried strips of corn tortilla are. They’re tossed in a spiced tomato sauce, until they’re this amazing combination of crisp but softened. 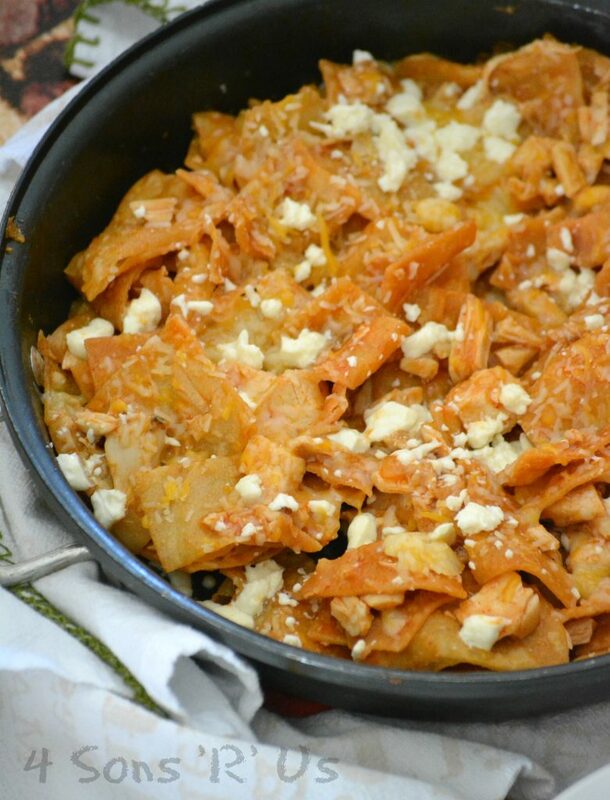 Topped with cotija cheese. Mmm, it’s finger lickin’ good. Cheese is supposed to be a compliment, and less is definitely more in this dish. 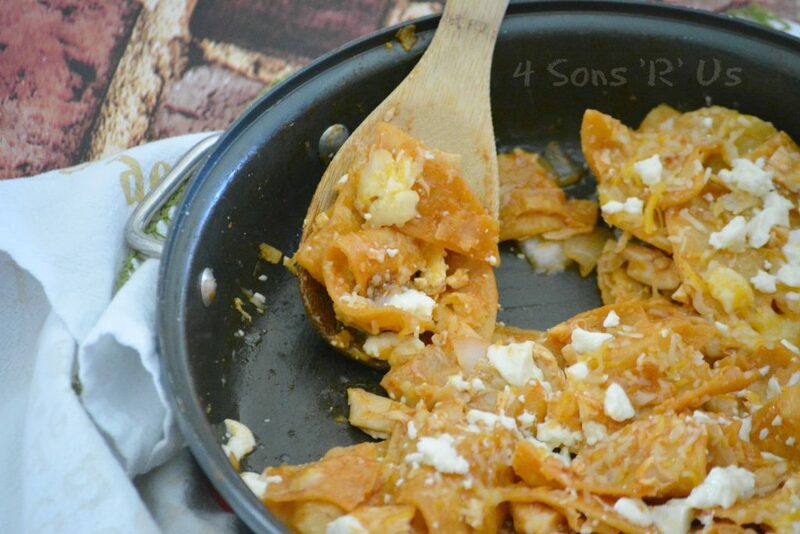 These cheesy chicken chilaquiles are by no means the authentic version I fell in love with. They are still very good, and much quicker for me to throw together on a busy weeknight. It’s my favorite version I’ve found, when I can’t get my hands on the real thing. So in this version, I have subbed canned enchilada sauce for the spiced tomato sauce. If ou want a more traditional ‘sauce’, then instead of using the enchilada sauce, add 1 can of Ro Tel tomatoes and a can of diced tomatoes to the bowl of a food processor. Pulse them together until the mixture’s mostly smooth, without any large lumps. Otherwise, stick with the enchilada sauce. Either red or green work with this recipe. We love both, and I’m partial to the green version myself. You can also serve this recipe with, or without the meat. So if you don’t have any chicken on hand, or you’re looking for a vegetarian meal- it still works! I love a versatile recipe. This dish is super simple to throw together, and only takes 15-20 minutes from start to finish. Pan fry strips of corn tortillas until golden brown and slightly crispy. Let them drain on a paper towel lined plate. Add the tortillas and the chicken to a skillet, set over medium heat. Pour in the sauce, tossing everything to evenly coat. Continue cooking, stirring once or twice if needed to prevent sticking, just until everything’s heated through. Sprinkle the shredded cheese evenly out over top, cover the skillet with a lid, and remove from heat. Let it sit for a few minutes until the cheese has melted. Serve immediately, sprinkled with the cotija cheese and minced onion. 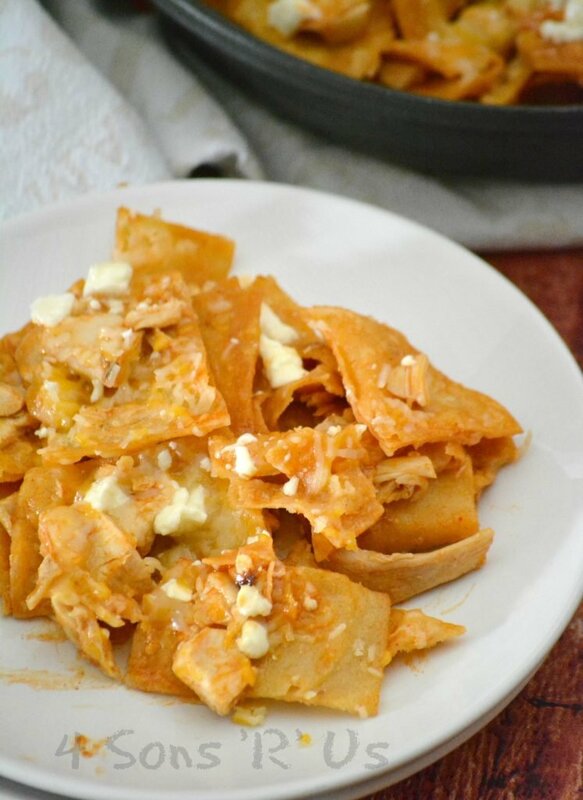 A quick and easy meal that can be thrown together in in one episode of Daniel Tiger, this cheesy chicken chilaquiles is the recipe for you. Also, it’s the perfect way to get your kids to try something different since it still includes basic mainstays like ‘chips’, chicken, & cheese! 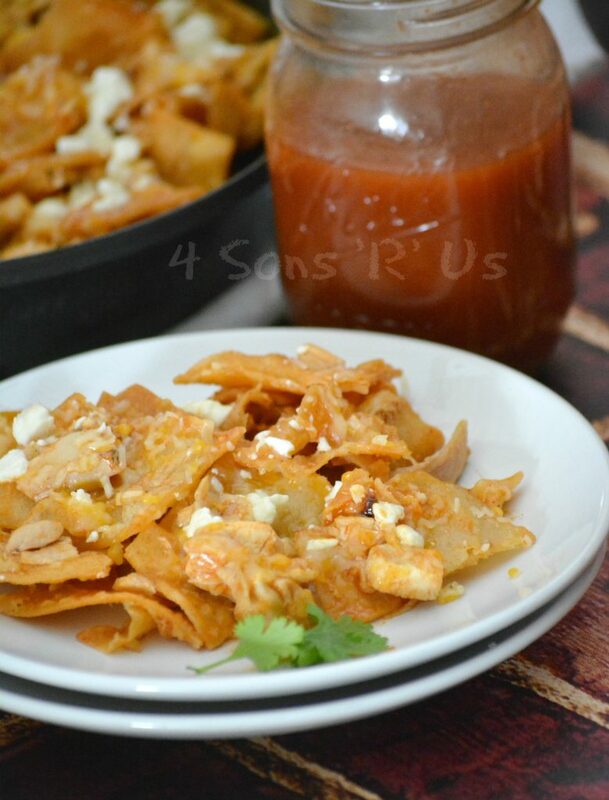 A quick, easy version of chicken chilaquiles- this one offers you sauce options in a skillet with freshly fried corn tortilla strips tossed in sauce and serve with salty, crumbled cotija cheese. Pan fry the tortilla strips, until golden brown and just crisped. Transfer the tortillas to a paper towel lined plate, to drain. Transfer the tortillas & chicken to a skillet, over medium heat. Pour in the enchilada sauce, tossing to coat. Heat just until the tortillas, chicken, and sauce are all heated through. Sprinkle with the shredded cheese, remove from heat, and cover. Let sit until the cheese has melted. Sprinkle with the remaining cheese, and onions (if using). Serve immediately.